The 2017 mission team arrives at the Santo Domingo airport. To see more photographs of this 2017 team in action, click here. 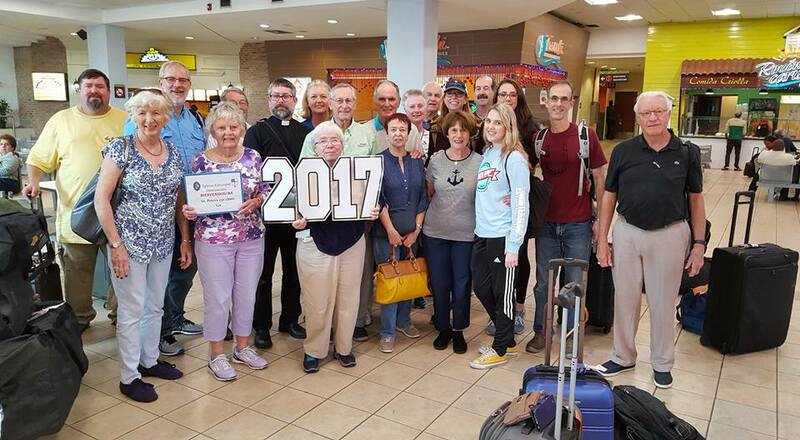 After three consecutive mission trips to Honduras, it was decided to redirect our efforts to our companion diocese in the Dominican Republic. We knew the needs of the population were great and that conducting trips to a location closer to home would be a much less expensive endeavor, as well as a much safer environment in which to work. 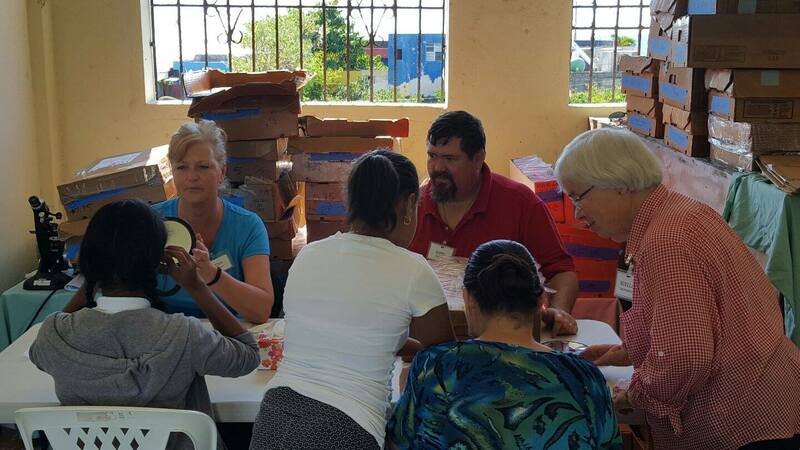 Father Sam Buice, our rector, along with Dave and Judy Sweeterman, travelled to the Dominican Republic for an exploratory visit to several potential mission sites. This trip was prearranged and escorted by missionaries from the Bishop’s office in the Dominican Republic. 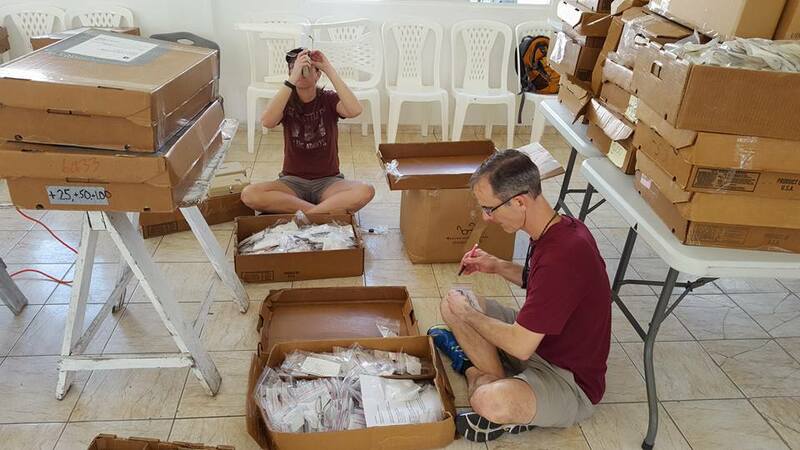 Members of the 2017 team checking eyeglasses that had been shipped in advance to the clinic site. To see more photographs of this 2017 team in action, click here. It was decided that our 2014 mission would take place at the San Esteban parish, in the city of San Pedro de Macoris. San Esteban has the oldest Episcopal church in the DR, as well as a school, a two-story clinic and diocesan conference center that provides room and board for up to 24 persons, all under the management of the local rector, who at that time was Padre Ramon Canela. The initial project was defined as landscaping the grounds of the rectory and campus. This did not seem an appropriate use of our time, talent and money. So Dave decided to change the mission to an eye clinic, using the local parish clinic building as the work site. Since we had no ophthalmologist or optometrists in our congregation, Dave placed an ad in From The Field, our diocesan publication, looking for a medical professional. We were extremely blessed when Alan Peaslee, an optometrist with the South Georgia Eye Partners, located in Valdosta, responded enthusiastically. Alan is a member of St. Anne’s Episcopal Church in Tifton, GA, where he served as senior warden in 2016. He was the ideal person to be medical director of our team. He had run several overseas eye clinic short term assignments with the Air Force Reserves. He knew exactly what equipment and medications would be required and how to plan for a more basic working environment that had none of the equipment required. His son Jason is an optician who came with us on our initial mission trip, filling another critical need. Among our first mission volunteers from St. Peters were Jim and Haydee Toedtman who became key players in the project from the very beginning, and in all our subsequent trips. Jim has procured several thousand pairs of used RX glasses from the Delaware Lions Club each year. Haydee has been our lead translator and handles our communications with the clinic staff, preparing the way for the mission team. There were 9 team members that first year, seven of whom were from St. Peters. Adrienne Williams, Judy Kenney and Sandy Thompson, along with Dave and Judy Sweeterman, all of St. Peter’s, completed the travelling team. We hired two or three local translators to help. In five days we were able to see over 500 patients and dispense several hundred pairs of prescription eye glasses as well as reading glasses and sun glasses. Jim Toedtman also arranged to have a generous supply of used baseball equipment sent from Flagler College, a donation from the baseball team. Jim is in charge of the Speakers program at Flagler where he also teaches a course on government. It was clear to everyone on the team that there is a virtually unlimited number of people who need our help. The cost of eye exams and prescription glasses puts them out of reach for most Dominicans. The rector and his staff at the clinic urged us very strongly to return. Checking eye pressure as a part of the overall optical examination. To see more photographs of this 2017 team in action, click here. 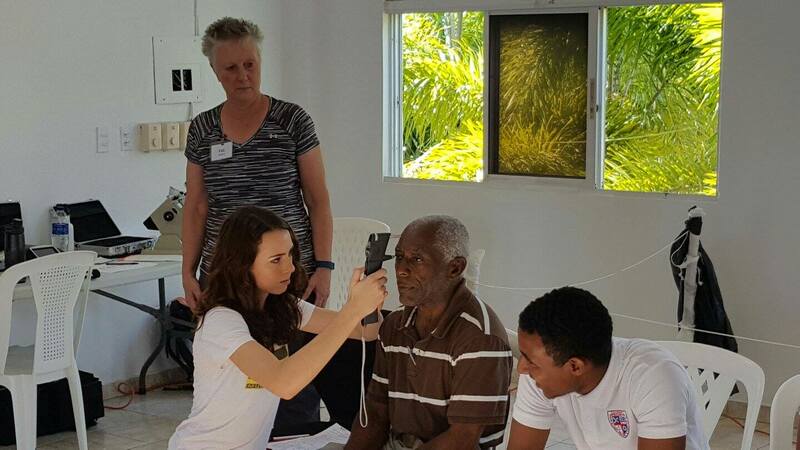 On our second year, our team expanded to 16 missionaries with the critical addition of Dr. Henry Croci, MD of Ophthalmology, Suzanne Croci, MS, nurse, and Dr. Sally Freeman, optometrist, from Effingham Eye Care in Rincon. The clinic is owned and operated by Sally and her husband Kerry, who are members of St. Luke’s Episcopal, Rincon. Gina Overstreet, optical technician at their clinic also joined the 2015 team. From St. Peter’s, we had Adrienne Williams, Cissy Brennan, Dave and Cindy Howell. It was the first year for Jurgen and Ximena Dinger. Ximena, a native of Chile, serves as one of the key translators for our medical professionals. 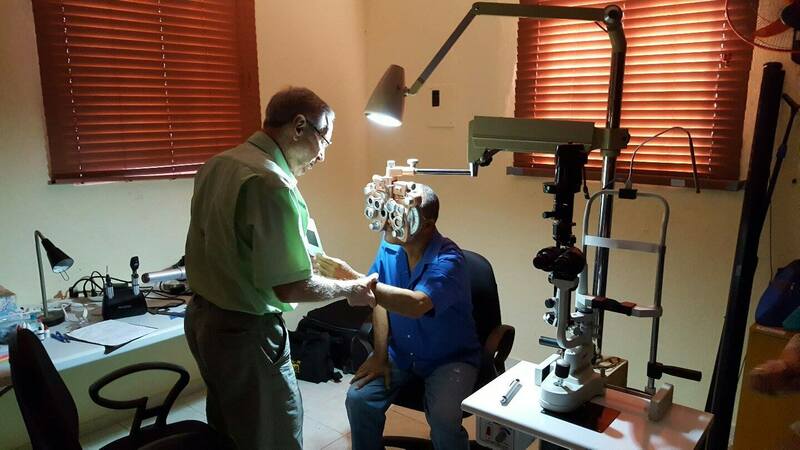 We were able to treat nearly 800 patients, gave 427 full eye exams, and dispensed approximately 700 pairs of glasses. We took 4000 pairs of glasses, as well as hundreds of pounds of medical equipment, supplies, and medications, all of which were donated by a growing network of partners, sponsors and contributors. We left some very valuable pieces of diagnostic equipment as a donation to the Clínica de Esperanza y Caridad, where we do our work. We also shipped used baseball equipment from Flagler College once again. Dr. Croci examines a patient. To see more photographs of this 2017 team in action, click here. Our mission project was blessed with the arrival of Reverenda Milquella Mendoza as the new rector of the San Esteban parish. Her responsibilities include management of the school and clinic, as well as the Kellogg Conference Center which provides lodging and meals to our team. Rev. Mendoza has proven to be an expert organizer and manager who expertly schedules patients and prepares the clinic and its staff for our work. She and Haydee Toedtman are in regular contact throughout the year to plan all the preparations for our mission. This year also saw the addition of John Moore, a very talented optician with South GA Eye Partners in Valdosta; Father David Rose, rector at St. Luke’s, Rincon; Katie Freeman of St. Luke’s; and Suella McCrimmon, Church of the Good Shephard, Swainsboro, Ga. We also added a local Peace Corps volunteer, Gabrielle Charles. As in the prior two years, we stayed at the Kellogg Conference Center on the campus of San Esteban, and directly across the street from the Clinic. Our team of 16 was able to see 800 patients, dispensing several hundred pair of prescription glasses and a large number of readers and sun glasses in four and one half days. We employed three translators from the San Esteban Church congregation. It became apparent that we needed a dependable referral program for many of our patients who were in need of surgery for cataracts or pterygia, or who suffered from glaucoma. While several patients did get the additional care needed, most did not. The most common problems were the cost of surgery or further care, or, the lack of transportation to the clinic that we had identified, which is about 40 miles distant. Fitting patients with glasses after their examinations are completed. To see more photographs of this 2017 team in action, click here. The impressive growth of the clinic continued in 2017. The team numbered 22, including 2 local Peace Corps Volunteers. Dr. Kerry Freeman, Ophthalmologist; Rena Simpson and Valerie Stolt, both opticians; Randy Stolt and Anna Freeman joined the team for the first time. One very important development was the discovery of one or two potentially viable options for patients who need to be referred for surgeries, glaucoma treatment, or other follow up care. For example in 2017, we had 137 patients who fall in this category. Dr. Hank Croci is leading the way in researching these options for our patients who can’t afford further treatment on their own. A full report of 2017 is found in the following pages. One way to measure the success of the eye clinic is by its strong and consistent growth.